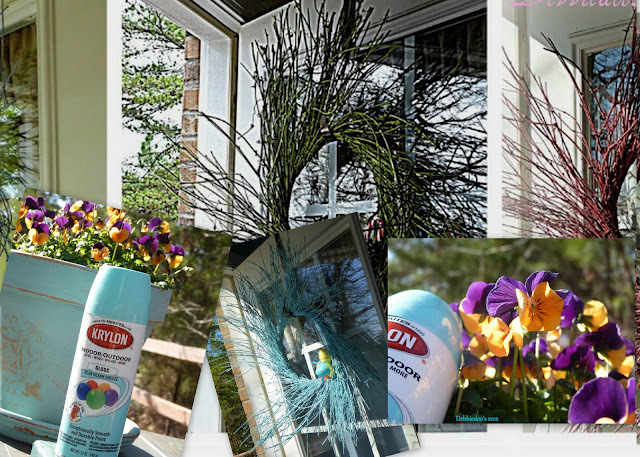 Debbiedoo's: Spring decorating! I know, I know...I'm crazzzzy! Spring decorating! I know, I know...I'm crazzzzy! Yes, I am Spring decorating already. I am like a dept store, always a month or two ahead of the season! Remember the other day, I showed you this new color I am in love with this season? It does scream Spring to me. You recall the wreath I change out per season with a can of spray paint? Well yes, it has one more life in it I think for color. I will break down ext time and just buy a new twig wreath. I like stretching a new life out of everything. Embellished with a few dollar tree foam eggs. You get a whole pack for a dollar..on a stick, and I just pulled the stick out and hot clued these on. Screams Spring, don't you think? The color is Blue Ocean Breeze! that is a beautiful color, its just a perfect color for spring and I think summer too, I had friends with a beachy themed house that used the color because it was the color of the ocean. Looks so good, that wreath served you well. I like it, I like it. It's a great spring color. The wreath looks fantastic! I'm so ready for spring too! This looks so simple, yet cute. I've used that color on my vintage lawn chairs out by our pool and love it! Love the wreath and I'll have to look at those at the DT Wednesday! Ha! We're on the same wavelength. I started my Spring decorating this weekend. You know what...if the weather is going to act like Spring I am going to pretend it is Spring. My Repurposed Life just directed me here in regards to winning the Annie Sloan paint chip sample! I love the way this one wreath has had so many looks! Love the new color! Thanks for sharing. Love that color!! Your wreath has lived a long and full life - amazing what a can of spray paint can do! One more month til spring - counting down the days! As for the color, I actually put a color very close to that same color on an accessory to a Spring/Summer wreath I made (combining two wreaths) for our front door. We obviously have the same terrific taste, lol! Like the color - fresh, crisp looking. You have gotten a lot of mileage out of that wreath which is a good thing. This makes me want to shout for Spring to arrive soon! Very beautiful and inspiring. Yes that does scream Spring! It looks very cute on your door with the little eggs attached. We have had such a mild winter that it seems like Spring is going to come in like a whisper. Some days, it feels like it's already here. I used that Ocean Blue on some plastic outdoor furniture and it looked great! Love that color! I'm keeping my eyes open for a twig wreath at the thrifts! I'm wondering if my dollar store has wreaths to go along with the eggs. Imagine if I found one for a buck, then used it all year spray painted for every holiday it would make it like cost only pennies. Wait, you don't have to imagine that do you? HEY I have old grapevines I took off the window.... Spray paint-need that, adding that to the list. The wreath looks wonderful, Debbie! Yes, I DO love that color. You take great pictures, girl!! Clever girl! LOVE that color too! Oh, that wreath is just great! What a brilliant color, so very springlike! I'm ready for spring too! It looks great all dressed up for spring! I already like how your laundry room is looking, Debbie ~ I had that same quote on the laundry room wall in my old house. I always enjoyed seeing it while I was doing laundry. Love that wreath Debbie! Can't wait to see your Laundry Room! LOVE it Debbie!!! I have a can of this color too...maybe I will spray one of my own wreaths:) Thank you for sharing at my party and I am looking forward to getting my paint chip samples. Love your wreath....what a wonderful blue :o) Happy Pre-Spring! It's looks great Debbie - love the egg on a stick! You really know how to repurpose! I love all the colors that your wreath has been, but this one is my favorite! You have inspired me to pull out my spring things to get started decorating! I think this color just might be my favorite of all the wreath colors so far! Looks great & oh so Spring-like! Oooh, that color is yummy! Actually, I think I used that color last year on a few things. I love grapevine & twiggy wreaths because they are so easy to paint & change. It may or may not be a bit early for you to be thinking of Spring, but The Man & I were planting some shrubbery & filling some pots & hanging baskets with pansies, stock, alyssum, & lobelia. We have peppers & tomatoes to plant, too. What can I say, this is Spring in AZ! Love the wreath. Nothing wrong with recycling. Smart move. Very cute and pretty color! Can't wait to see your reveal!! Wow you got your monies worth out of that wreath. Way screams spring now. I am getting ready for spring. I have had enough of the cold. The wreath looks great the color is awesome. Excellent colour choice and the eggs are so pretty. Oh, no. The ivy is gone :). Love the new Ocean Breeze color. Very bright and springy! It does scream spring AND it's that pretty shade of blue I love. Debbie, do you bring each photo up in a photo program to watermark them, or is there an easier way? I love how you keep reinventing this wreath! Looks cute! Wayyyy to cute and you! Love the latest transformation, Debbie. The eggs are so cute. I love the wreath!!! Perfection for SPRING! Now on to that sneak peak of the laundry room...I won't be able to sleep tonight!!! It looks heavenly and the wall words are just what I want in my laundry room. You'll have to tell me where you got them. Oh my! You used my favorite color of spray paint! Your wreath is so fun and cheery! We would love to have you share it at our link party! I know our readers would really enjoy it! Take care! New way to plant your garden seeds.. Exciting! Entertainment center makeover final reveal!